Find yourself repeatedly hitting the snooze button? Try these 5 tips to make AM workouts an easy part of your routine. 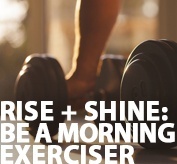 It's a great feeling to get your workout in early - plus, you'll have a boost of energy to carry you through the day! Morning exercise carries many benefits. You'll jump-start your metabolism and keep it elevated for hours. As a result, you’ll be burning more calories all day long. AM exercise also energizes you for the day and increases mental acuity, which can last four to ten hours after your workout ends. Also, by finishing your workout in the morning, you can better focus on the day that lies ahead. But most of all, nothing can top the feeling of gratification knowing that you have done something good for you.